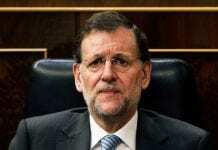 SPAIN’S new leader Mariano Rajoy is under increasing pressure to reveal plans to deal with the deepening recession. EU leaders are already demanding radical reforms in a bid to restore market confidence. It comes as Spain recorded the highest interest rates for 14 years, with 2.98 billion euros of the country’s debt being sold at auction last week. The move was part of a wider effort by Italy, Spain, France and Belgium to refinance 17 billion euros of bonds. But as Spain has seen zero growth over the last quarter and has the highest unemployment figures in the industrialised world, urgent moves are needed. It has even been hinted that Spain might be forced to revert back to the Peseta. In response, Rajoy has so far given only a vague outline of his priorities, which include Europe, the public deficit and labour reform. Sources close to Rajoy even claim he is considering applying for international aid as one option to shore up its finances. However, the International Monetary Fund (IMF) has denied that Spain or Italy have asked to be rescued. Rajoy – who is against the euro zone being turned into a two-tier system – will not be officially sworn in until December 20. But Rajoy and his predecessor Zapatero have met to discuss the possibility of bringing the formation of the new government forward to appease the markets. Meanwhile, the EU has called for Rajoy to introduce immediate changes in the labour market in an effort to reduce what it describes as the ‘unsustainable’ unemployment rate. Rajoy wont take power until the 13th of december a week before he goes om his Christmas holidays no doubt, it’s nice to see MAÑANA, MAÑANA is still a way of life, what crisis? Mark, Rajoy has won …….. be reasonable, give him some time to come up with a good booty sharing plan, thats what holidays are for. Take the private official Jet or the Audi for a little spin in the snow or the sun, bring the booty staff to cook up a good retirement scheme under the tree, after all he may only have 4 years. Also consider, its not so easy this time around, because the EU cow is kinda dry right now. Rajoy is right – there is NO CRISIS in Spain!!! what’s the exchange rate of YEN to Euros & does Chop Suey go with Tapas & Vino Blanco? actually BS try a nice cold dry Fino with Sushi sometime, mind not Sushi from the freezer section in your local market, not everything green in that package is necessarily Wasabi, but I am sure you know that already ……. Oh, and whatever you do please avoid paying for your Chop Suey in Yen.